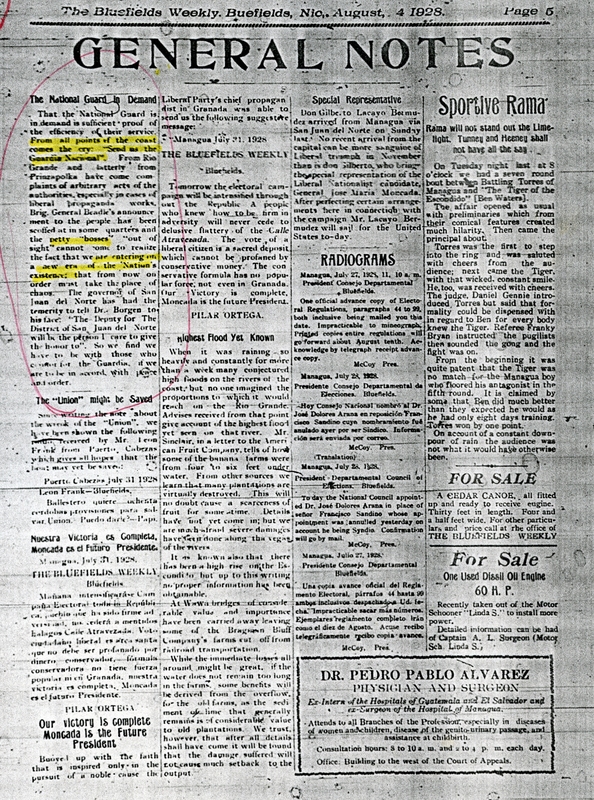 THIS IS THE second PAGE of documents for the second HALF of 1928 on Nicaragua's Caribbean Coast region, housing materials dated during the first 17 days of August. In these documents we see Capt. Edson's 130-some strong Wanks Patrol continuing upriver past Bocay toward Guadalupe Rivera's property at Santa Cruz (Vigía), and the capture of Rivera's cousin, the EDSN-affiliated Abraham Rivera, along with a cache of papers and correspondence (Aug. 12; on Rivera's interrogation in Jinotega and subsequent release, see the TOP 100, PAGE 11). We see the Marine aerial offensive against the rebel concentration in Poteca in the northeast Segovias (Aug. 9), and confusion about the purpose of the offensive. As Edson writes to Major Utley on Aug. 10, "I would like a definition of my mission." Utley's Aug. 16 "estimate of the situation" offers a crisp capsule summary of how the Marines see their options in the Coco-Bocay zones. Captain Byron Brown (Ret. 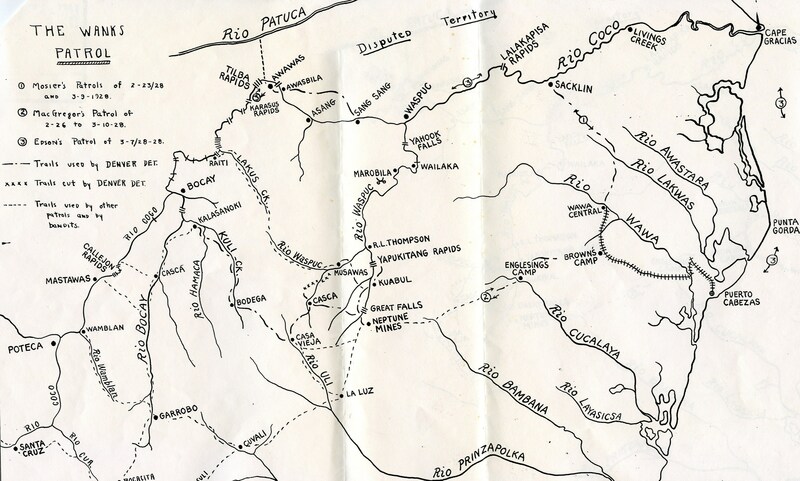 )'s account of his intrepid inspection trek up the Patuca River & overland to the Coco & his recommendations for tigtening Guardia control of the "Wanks-Patuca-(Guanquibila)-Trail" offers important details on the political geography of the deep interior (Aug 5). Meanwhile in Bluefields, Major Sage's Aug. 17 report shows the corruption of the civil police by the Cuyamel Fruit Company and its "secret fund" for bribes and payoffs — an investigative tack Sage also follows on the next page in his report on Nicasio Vargas, former commandante of civil police in El Bluff (across the bay from Bluefields) and the systemic bribery of public officials by mahogany & fruit companies (Aug. 20). 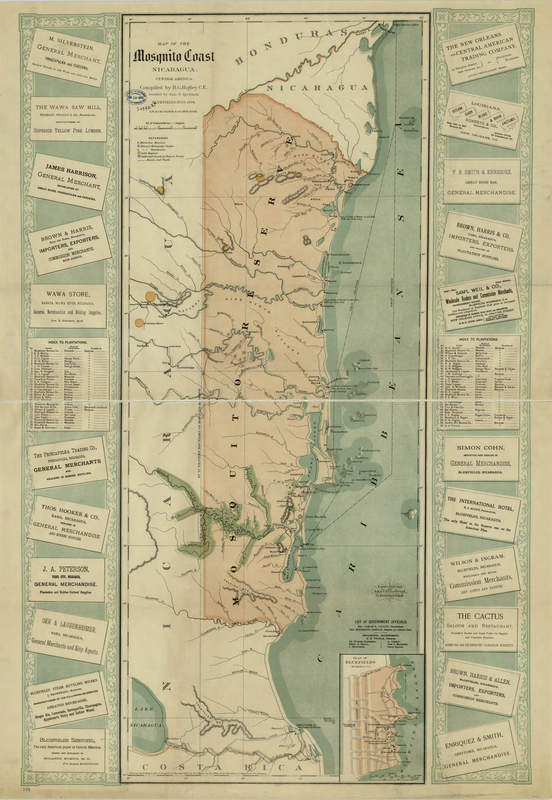 Overall, and in comparative terms, as Las Segovias seethes in popular resentment against the Marine invasion & occupation & the EDSN gains effective dominion over much of the deep interior, the Atlantic Coast remains largely quiescent. Radiogram from Gen. Feland, Managua, to Major H. H. Utley, Puerto Cabezas. "The National Guard in Demand," The Bluefields Weekly. Report on conditions in Wanks-Patuca River Area, Capt. Byron C. Brown, Ret., Puerto Castilla, to Fred T. Cruse, US Military Attaché, Tegucigalpa, p. 1. 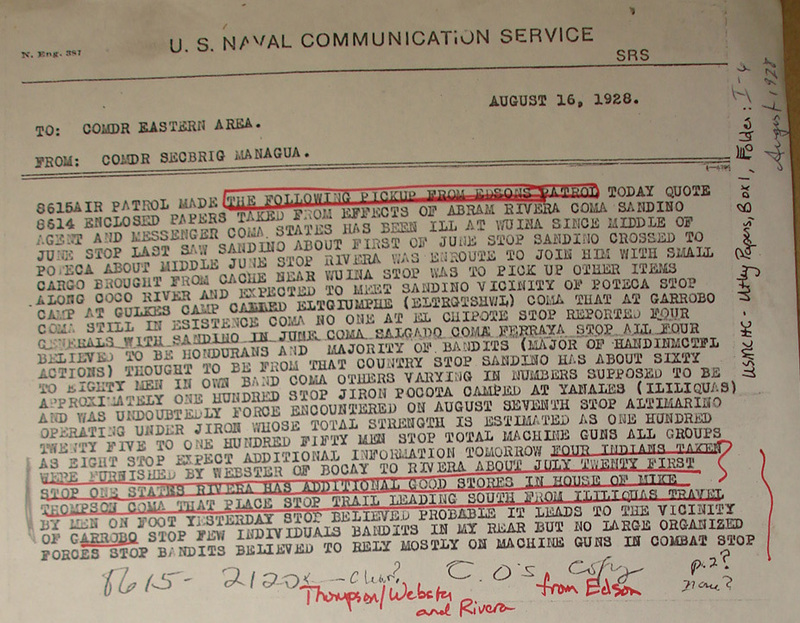 "Dear Major: ¶ Upon receipt of your message regarding Sandino’s reported evacuation of the Bocay district. I left Puerto Castilla accompanied by Austin Cabourel of Limoncito, Honduras, to make a personal investigation of the situation. ¶ Upon reaching the upper Patuca we crossed over into the Wanks-Awawas District, via the old Wanks-Patuca trail. I found that the Marine outpost, formerly under the command of Lt. Carroll, had been removed from the island in the Wanks River to a point on the right bank eight hundred yards downstream. This outpost is ineffective. As situated it leaves the Wanks-Patuca-(Guanquibila)-trail open, across which questionable characters are continually passing. The personnel of the outpost is insufficient. The Corporal in charge of this outpost is not qualified to be in command and should be replaced. His personnel, consisting of seven men, are all raw recruits. ¶ I strongly advise increasing the personnel of this outpost and placing it under the command of a competent non-commissioned officer or lieutenant. Its present location should be abandoned in favor of a point on the left bank of the Wanks River above the Guanquibila Trail, from which two Cossack posts should be established, one above the main outpost and another stationed at a strategic point on the Trail. All pitpans (Suma Indian name for the big dugout canoes, F.C.) proceeding both up and down the Wanks River should be stopped and their crews recognized and the cargoes inspected for contraband. The Cossack post stationed on the trail should halt all parties entering or leaving the zone. ¶ Furthermore I would recommend establishing an outpost at Guanquibila with a Cossack post at a point above the Guampu River to prevent suspicious characters from penetrating into the interior of Honduras via the Guampu-Lagarto-Culmi Trail, which enters a district . . . "
Report on conditions in Wanks-Patuca River Area, Capt. Byron C. Brown, Ret., Puerto Castilla, to Fred T. Cruse, US Military Attaché, Tegucigalpa, p. 2. " . . . where there is considerable Liberal-(Red)-sympathy and activity. ¶ The upper trail from Nicaragua to the Patuca-(Piedra Chata Trail)-is used by many recruits and over which there is no question but what arms and ammunition have been carried. In previous communications I have advised you regarding the suspicious activities of J. Amado Flores, who is operating a Mahogany Camp in this district, and who openly professes to be a Sandino sympathizer. It will be well to add that Flores’ associate, Frank Romero, who is at present in Trujillo, is not above suspicion on this connection. Such men, who are rendering assistance should be kept under closer surveillance. ¶ Many Indians have reported to me that Sandino is in readiness to cross the border and will use the upper trail; that his men number between six and eight hundred. Consequently I also recommend establishing strong outposts at both ends of this trail. ¶ I have personally established guards at Guanquibila and at a point above the Guampu River, and will be advised by runners in case of any activity. Upon receipt of any information I will communicate the same to you by radio. ¶ I have received much valuable assistance from Mr. W. H. Scott, American Vice-Consul at Puerto Castillo, and from Mr. C. E. Rollins, manager of the Trumillo Railroad Company, both of whom have shown active interest in the proceedings and are cooperating in all instances. ¶ Most respectfully yours, ¶ Byron C. Brown, ¶ Captain U.S.A. (Retired)"
Letter of Complaint from F. Spinoza C., Leonardo Cajina, José Matamoros Jerez, Eleazar Meza, Rama, to the Chief of the Guardia Nacional, p. 1. "We permit ourselves to transcribe you the following note: ¶ ‘Managua, June 7, 1928 General Jose Maria Moncada, Present. Sir: I have the honor of directing myself to you to treat a case that is of great importance for the progress of Nicaragua. At times crimes are committed in the country that should always be punished severely. It is the belief that in the past, that the committers of crimes escape from punishment through political affiliation, and this has occurred through political influence on both sides, by this way hoaxing the justice. You may understand clearly that such state of things cannot bring order and prosperity; these things carried to the extreme, fosters hatred, civil war and insecurity. I firmly believe that if the Directors of Political parties use this influence only to the end of justice, without favoring those of their party that commits a fault, the origin of war would disappear, and by this way secure a base of unification for Nicaragua. ¶ The Guardia Nacional is an instrument put in the hands of the people of Nicaragua to be well used or obstaculized. ¶ The view point of the Guardia Nacional is very noble: they only want to serve and establish in Nicaragua, well organized communities. You will develop a true patriotic work if you aid the Guardia Nacional, as Chief of a party. We highly ask you to cooperate through or with your partisans, on whom you have influence, to aid the Guardia in the apprehension of those that commit crimes, violate the law and threaten the security of communities and individuals, without taking in consideration political parties. ¶ With sample of consideration ¶ I am your attentive and sure servant, ¶ (f) E. R. Beadle. ¶ The former communication has been published in the newspaper ‘DIARIO MODERNO’ Managua No. #2234 of the 15 June 1928 and it from where we got the idea to put it to your high knowledge, as Chief of the Guardia Nacional in this section, some crimes that you can investigate through your commands, those crimes need to be corrected or punished, because they have been committed by employees of this locality, above all these that actually administrates justice, and to what I refer below: ¶ Nicanor Obando’s son who is functioning as Alcalde, is functioning illegal, from the moment that he is only an alderman and not Alcalde or an alternate. The Alcalde elected is Mr. Moises Medina who is dead, and the alternate by law Mr. Benjamin Brenes to whom the seat corresponds according to the municipal organic law. ¶ Nicanor Obando was placed as Alcalde in 1926 by the stationed armed force that was in Rama and from then he has retained the function inconstitutional. The permanency of Mr. Obando in the Alcalde’s office hoaxes the law, and the municipal community and the Guardia is called to avoid, placing before the municipal’s interests one that the law grants such rights that is Mr. Benjamin Brenes alternate. ¶ And there is something of greater importance that impedes Mr. Orando to continue functioning as Alcalde. Orando has committed some crimes, personally, public and in a drunken condition and his condition as Alcalde always saved him from being punished. These crimes are: ¶ He cut Mr. Manuel on the face, under the left eye, with the caliber of his revolver that he always carry. This cut has left him a permanent visible scar. It is a crime that needs more than correction, and he never was processed, and is still functioning as authority . . . "
Letter of Complaint from F. Spinoza C., Leonardo Cajina, José Matamoros Jerez, Eleazar Meza, Rama, to the Chief of the Guardia Nacional, p. 2. " . . . and he never was processed, and is still functioning as authority. ¶ Juan Cedeflo received a cut on the eyebrow from the same Nicanor with the caliber of the same revolver that he used to carry, at Muells the main dock of Siquia the 4th of May, he never was processed either, and he continue in his function as Alcalde. ¶ Benito is the third person that received a cut on the head from Obando; he never was punished for that crime either. ¶ It is a fact and it can be proved, that Nicanor Obando’s son, Gustavo Balladares ex-Inspector of Police and Jacobo Moreira ex-Commandant of Hacienda Guard of this city, collected head tax at $2.00 per man and it is said that all the money was not turned over to the municipal treasurer and an active investigation by the Guardia is necessary to find out where the money is. ¶ The liquor is sold at a higher price than it should be, you can see according to the following: ¶ The Nicaraguan Government sells the quart of liquor in the deposito or store room at $0.75. ¶ $0.55 Correspondents to the whole sale dealer for every quart he sells. ¶ $0.18 To the Fiscal Agent as honorary for every quart that is sold. ¶ Total $1.28. 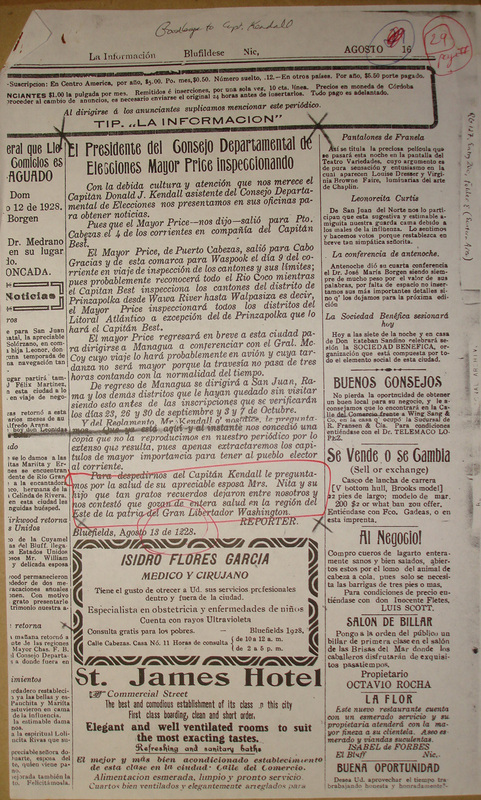 ¶ A quart of liquor or guaro should be sold at $1.28; this is the obligated price according to the disposition of the Minister of Hacienda dated 21st October 1927. But the Fiscal Agent Bernardo Segovia is selling it at $1.25 per quart to those that have privilege and $1.30 to those that do not have, it is illegal, it is merely an exploitation of the consumer, and a hoaxing of the law, all this in the Agents benefit, if the Minister’s Note is not revoked, which should be verified, to oblige the Agent to deliver the increased and illegal value collected. ¶ Nicasio Aguilar was arrested for contraband and was released after paying a fine of $165.00, he paid $125.00 Mr. Plutarco Guindos actual secretary of the actual Alcalde Obando, stood the bond for the rest of money. The $125.00 that Aguilar paid was received by the ex-Commandant of Hacienda Jacobo Moreira and ex-Commandant of Police Gustavo Balladares. ¶ Carlos Morales was arrested for contraband he was released after paying $150.00 that the ex-Commandant of Hacienda Jacobo Moreira and the ex-Inspector Gustavo Balladares received in person which sum Morales was obliged to pay, without initiation of any process. Morales had to sell his cattle to pay the fine, and it is known that Bernardo Segovia and Daniel Genio bought a bull and a cow of the animals that was sold by Morales; to butcher in the town. ¶ Bibian Mendoza, from ‘RIO SIQUIA’ was arrested by the ex-Commandant of Hacienda Guard Jacobo Moreira and was forced to pay a fine of $15.00 right there, only because the mentioned Commandant suggested that Mendoza knew the place where Jorge Gonzalez had a guaro factory. The most remarkable part of the story is that Mendoza’s mother had to pawn her jewels to pay the $15.00, and one of Moreira’s guard by name Julio Montenegro took interest in finding money to make the loan. ¶ Eduardo Cano also had to pay $30.00 to the same ex-Commandant Morales for being accused of having (3) quarts of guaro taken away from him. ¶ The Hacienda Publica and the Municipality are defrauded according to what is said, by slaughtering cattle without the previous representation of a Fiscal, Municipal and a Beneficency’s boleta. It is said that the Commandant of Guadalupe collects the value of the taxes, but the boletas are not bought. The article 291 of the Police Regulation establishes the requisition to permit the slaughtering of animals, and it would be convenient that the Guardia attends this, of so much benefit for the Locals interests and the people at the same time . . . "
Letter of Complaint from F. Spinoza C., Leonardo Cajina, José Matamoros Jerez, Eleazar Meza, Rama, to the Chief of the Guardia Nacional, p. 3. " . . . Various fines imposed by the ex-Commandant of Hacienda Jacobo Moreira actual Director of Police Bluefields to Mr. Carlos Morales, Nicasio Aguilar, Bibian Mendoza and Eduardo Cano, can almost be proved that they were never turned over to the Government’s Office. This is worse than what those that make guaro, and were punished for it, and it should be investigated, the same is recommended for the other mentioned case, to indict the administration of this city in a via of progress and ample legality. ¶ ‘The Guardia Nacional is an instrument placed in the hands of the people of Nicaragua to be well used or obstaclized’ says General . R. Beadle in his communication to General Jose Maria Moncada, and here is the opportunity to make use of the high view point on which the Guardia is endowed to do away with the abuses and punish the crimes that are mentioned in this letter. ¶ From our part, as liberal citizens, we come before you to put to your orders our scarce abilities, to the end that the law be no more hoaxed and so help to keep order and prosperity. ¶ Respectfully, ¶ F. Espinoza C., Leonardo Cajina, Jose Matamoros Jerez, Eleazar Meza." Claim of Freiberg Mahogany Company, Major H. H. Utley, Puerto Cabezas, p. 1. "References: (a) Letter from The Honorable Nicholas Longworth to the Secretary of State, dated 13 June, 1928 ¶ (b) Letter from Commanding General, Second Brigade, to Commander, Eastern Area, dated 25 July, 1928 (WWS-s) ¶ (c) Statement of Lieutenant Ranck, USMC. 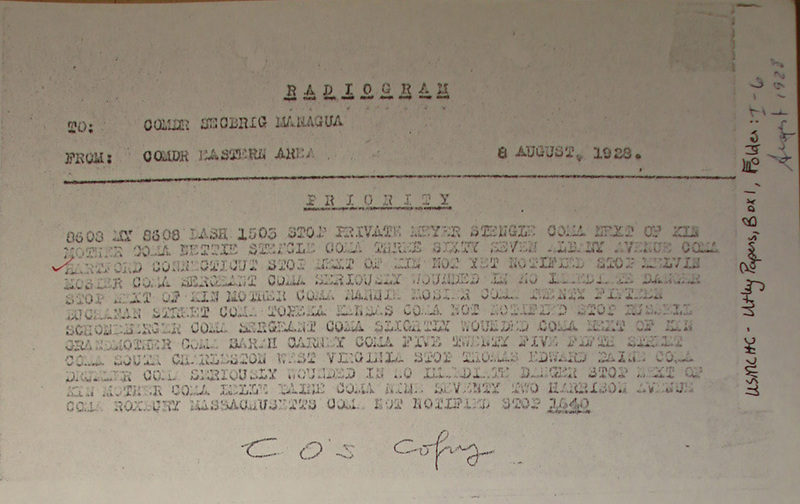 ¶ (d) Letter from Lieutenant Colonel Englesing to Commander, Eastern Area, dated 4 August, 1928. ¶ (e) Letter from Area Quartermaster to Commander, Eastern Area, dated 2 August, 1928. ¶ (f) Letter from Area Quartermaster to Mr. T. Mullen, dated 12 July, 1928. ¶ (g) Statement of Sergeant Heller, USMC, ¶ (h) Statement of Private Shockley, USMC. ¶ (i) Statement of Corporal McCauley, USMC. ¶ (j) Statement of Sergeant Walter, USMC. ¶ Enclosures: (10) Copies of references (a) to (j) inclusive. ¶ 1. The undersigned has made as complete an investigation as is practicable at the present time. Both Captain Linscott and Captain Walker are out on patrol against the bandits and it is impracticable to secure their statements at the present time. ¶ 2. The bandits reached La Luz April 12th and the Pis Pis mining area April 15th of this year. At that time the force in this area was small. The logging camp – locally known as ‘Eugene’s Camp’ – of the Freiberg Mahogany Company lay on the direct route of the bandits from Pis Pis to Puerto Cabezas. It is reliably reported that at least one column of bandits started over this trail with the avowed purpose of raiding the properties . . . "
Claim of Freiberg Mahogany Company, Major H. H. Utley, Puerto Cabezas, p. 2. " . . . of the Standard Fruit and Steamship Company at and near Puerto Cabezas. To do so they must necessarily have passed through logging camp of the Freiberg Mahogany Company above referred t. As soon as reinforcements arrived a patrol of one platoon of the 60th Company (Captain N. W. Linscott commanding) was sent to the Pis Pis mining area. 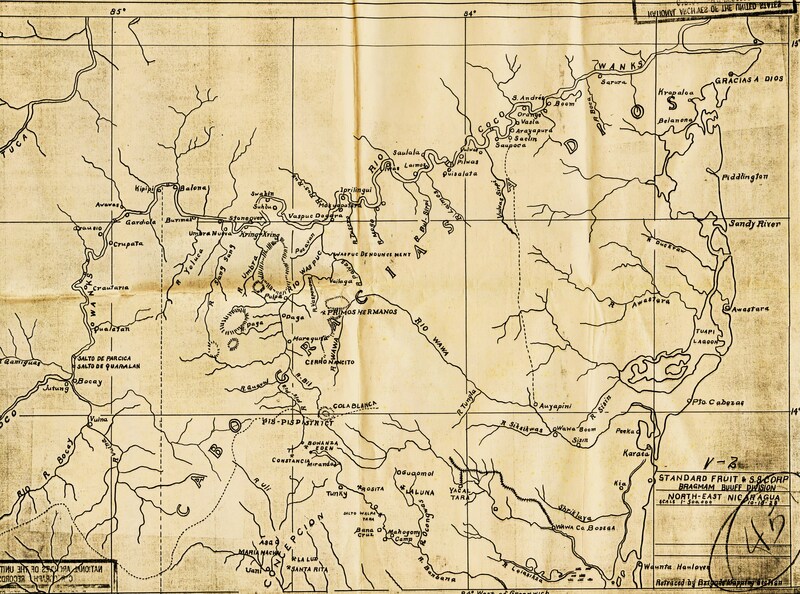 The bulk of this patrol moved overland via Brown’s Camp, Eugene’s Camp and Englesing’s Camp, while a detachment under Lieutenant Ranck moved by motor via Wausta and the Cucalaya River to Englesing’s Camp with the greater part of the supplies for the platoon. ¶ 3. As soon as additional transportation could be procured the 59th Company (less one platoon) was moved out in support of the 60th Company, following the route taken by Captain Linscott. Until the arrival of Captain Linscott’s column at Englesing’s Camp said Camp and the logging operations based thereon were open to raids on the part of the bandits then in the Pis Pis. His movement with that of Lieutenant Ranck, was to effect affording protection to the operations of the Freiberg Mahogany Company, as under the avowed policy of the bandits all American owned industries were subject to destruction and seizure. ¶ 4. The charges that the Marines took all the boats of the Freiberg Mahogany Company, appear to be correct only in part. The boats taken appear not to have been seized, but to have been rented by the senior officer on the spot when needed as a military necessity. The Area Quartermaster has settled some of the claims of the Freiberg Mahogany Company submitted by their agents, or those represented to their agents, and has pending additional bills which are not yet in such shape as to permit . . . "
Claim of Freiberg Mahogany Company, Major H. H. Utley, Puerto Cabezas, p. 3. " . . . their payment. When, or if, these bills are properly [section missing] they will, if they are believed correct and just, be paid [section missing] the Area Quartermaster. If believed unjust they will be returned with advice that the claim be submitted to Washington for settlement. ¶ 5. The statements contained in the basic letter regarding provisions, and especially [?] do not appear to be in accordance with facts. ¶ HAROLD H. UTLEY . . . "
Statement of Private David E. Shockley, 3 Aug., Claim of Freiberg Mahogany Company, Major H. H. Utley, Puerto Cabezas, p. 4. " . . . Headquarters, Eastern Area, Nicaragua. ¶ Marine Barracks, Puerto Cabezas, Nicaragua. ¶ 3 August, 1928. ¶ STATEMENT OF PRIVATE DAVID K. SHOCKLEY. ¶ On or about the 9th of May, Captain Linscott left Mr. Engleson’s camp for the La Luz Mine leaving a reserve supply of rations with Sergeant Whitmarsh and ten men. About three days after Captain Linscott was gone Captain Walker came through, stopping at our camp overnight. He left the next morning taking some of the supplies that we had, saying that there would be supplies up there on the 17th. About three o’clock the same day an Indian came in with a Marine prisoner and a note from Captain Walker to send him in to Puerto Cabezas the first available transportation. One day, the date I don’t remember, Mr. Mullen was in our camp. He said that he was going up the river to get some supplies he had cached and bring them down the river until the rumors that were out blew over. That was the last I saw of him until the night of the 17th in Wounta. ¶ On the 14th Sergeant Whitmarsh said that he had a turkey bone in his throat and that it was hurting him, he said he thought that he had better come to Puerto Cabezas to the hospital. So we left the next morning the 15th, bringing with us the prisoner, a sick music, and one native for guide, Sergeant Whitmarsh and myself, 5 men in all. The Sergeant left Private Philips in charge. The first night we camped on a sand bar, the next night which was the 16th, we camped in a banana patch, the next morning, the 17th arrived at Wounta. We had no supplies and the Sergeant bought our meal in Wounta. We were in Wounta all that day and that night, leaving the morning of the 18th. About 12 o’clock the night of the 17th Mr. Mullen came in at Wounta and we left the next morning before he got up. I didn’t talk to him while we were there. 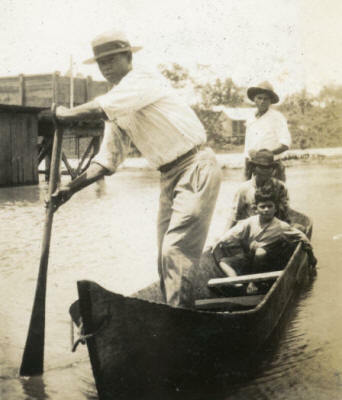 We met Mr. Behr in Wounta and he hired a boat for me to go to Puerto Cabezas in. We had three boats belonging to Mr. Mullens. I had one which I left in Wounta. It was in good condition. Mr. Behr brought the other two down the river to Wounta a week later. ¶ DAVID E. SHOCKLEY, ¶ Private, U.S. Marine Corps . . . "
Statement of Frank C. Englesing, Lieutenant Colonel, U.S. Reserve, 4 Aug., Claim of Freiberg Mahogany Company, Major H. H. Utley, Puerto Cabezas, p. 5. " . . . Puerto Cabezas, Nicaragua. ¶ 4 August 1928. ¶ From: Frank C. Englesing, Lieutenant Colonel, U.S. Reserve. ¶ To: Commander, Eastern Area, Nicaragua, Marine Barracks, Puerto Cabezas, Nicaragua. ¶ Subject: Claim of Freiberg Mahogany Company. ¶ 1. On or about 9 May 1928, I was accompanying a detachment of the Wawa patrol. Captain H. D. Linscott, U.S. Marine Corps, commanding, in the capacity of guide. On or about the same date we passed through the mahogany cutting camp of the Freiberg Mahogany Company, located on the Cucalaya River, and remained there for a few hours for the purpose of transporting pack animals across the above mentioned river. During this time I have no hesitancy in stating that the property of the Freiberg Mahogany Company at this place was not molested in anyway whatsoever. ¶ 2. In regard to the statement that all of the lard was taken by men belonging to the detachment referred to above, I can state that men working for the Bragmans Bluff Lumber Company took, by mistake, one (1) forty pound tin of lard from the Freiberg Mahogany Company’s boat. Upon discovery of this mistake, the amount of lard was returned to the Freiberg Mahogany Company’s representative in that district. ¶ Frank C. Englesing." Radiogram from Major H. H. Utley, Puerto Cabezas, to Gen. Feland, Managua. Brigade Field Message No. 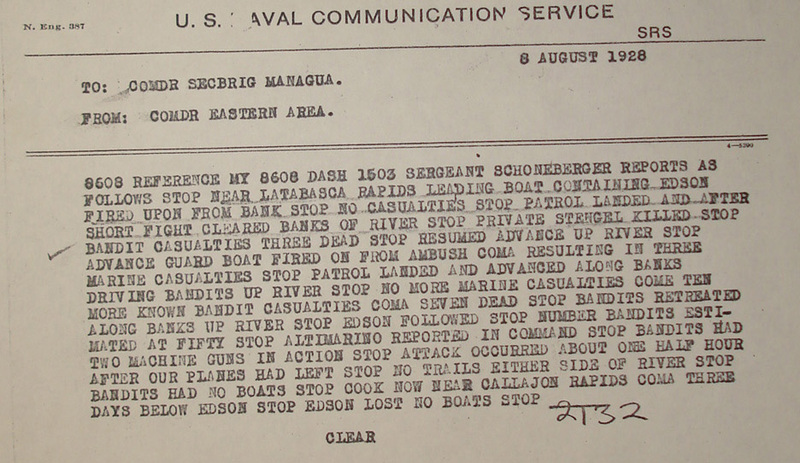 27, Boats on the Rio Coco, Major Oliver Floyd, by direction of Gen. Feland, Managua, to Capt. Edson, en route to Poteca. 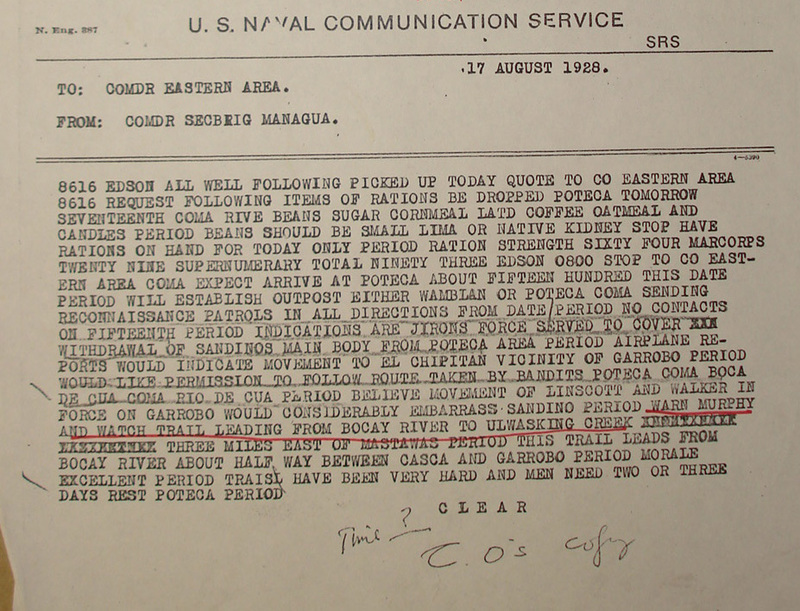 Memorandum on Strength on Coco River, from Eastern Area, Major O. Floyd, Managua. Radiogram from H. H. Utley, Puerto Cabezas, to Gen. Feland, Managua. Telegram from US Minister C. Eberhardt, Managua, to Secretary of State, Washington D.C.
Letter from Capt. M. A. Edson, Mastaquas, to Major H. H. Utley, Puerto Cabezas, p. 1. "Major Utley:- ¶ Am enclosing a few papers, much of which has a mark of some kind. ¶ H. Cook arrived yesterday at 0900, but his second boat, containing rations, did not arrive until after dark. As a result, I spent today in reorganization and preparation for next move. ¶ Am now organized into one company of two platoons of three squads each, plus company headquarters of eight enlisted. There are 32 Denver men, 28 Galveston men and one Navy – total of 61 Marines and 1 USN. ¶ My biggest difficulty now is sore feet. I have a request for shoes in Cabezas. One pair of those per man in the field is urgently needed as well as 240 pairs of socks, woolen. Malaria is plentiful mostly recurring cases due to lack of sleep and strenuous days. I have about 200 rounds of 30 cal per man – and 300 rounds of .45. Arrangements will have to be made to deliver additional when requested but not before. ¶ From messages received from Brigade, it would seem that except for [Shechmore's] patrol, none of the . . . "
Letter from Capt. M. A. Edson, Mastaquas, to Major H. H. Utley, Puerto Cabezas, p. 2. " . . . patrol indeed have left their base. If you will look at the map, you will see that I have as territory some 200 miles long by 50 miles wide to case with a force of 60 men. There are no supporting troops within 100 miles in any direction. The territory to be covered is that in which it is certain Sandino has concentrated his entire posse. ¶ I would like a definition of my mission. ¶ At present my mission, as assigned, is to proceed to Santa Cruz, establishing outposts at crucial points. With the force at my disposal, I cannot reach Santa Cruz and adequately garrison my line of supplies. No force of less than one section should be left at any point – and that is the absolute minimum for any advanced patrol. This section is full of good trails, and to protect and hold the river, outposts should be very close together. ¶ If, however, my primary mission is to destroy the bandits, it seems to me best to keep my entire force intact, at least to Poteca, and depend upon mobility rather than outposts. Mastawas controls the territory south and southwest of here and will protect our line of evacuation. If you can supply me with food and clothing by air, I believe that my command can make it decidedly uncomfortable for the outlaws. [Section missing] probably, but we hope . . . "
Letter from Capt. M. A. Edson, Mastaquas, to Major H. H. Utley, Puerto Cabezas, p. 3. " . . . the results will justify them if this is approved. I shall cut loose from boats, and using captured criminals, move by trail. The river will still be used for evacuations, since it can be traversed under cover of darkness with comparative safety. ¶ Am moving up river tomorrow, taking mules and boats. Due to lack of boat crews some men of necessity have to move by trail. Tell Brigade I am having enough to do to keep my own boat in operation without bringing some to Quilali for their outings after we do the work. ¶ The arms returned were found in a nearby cache here. Some dynamite was also discovered. The two bombs were even made for our amusement at Gulke's. ¶ Map showing position there is enclosed. ¶ Medical supplies received all OK. Thank you. ¶ Respectfully, ¶ Merritt"
12 August 1928 (0830, 0840, 1809). Radiograms from Capt. M. A. Edson, Upper Coco River, to Major H. H. Utley, Puerto Cabezas. 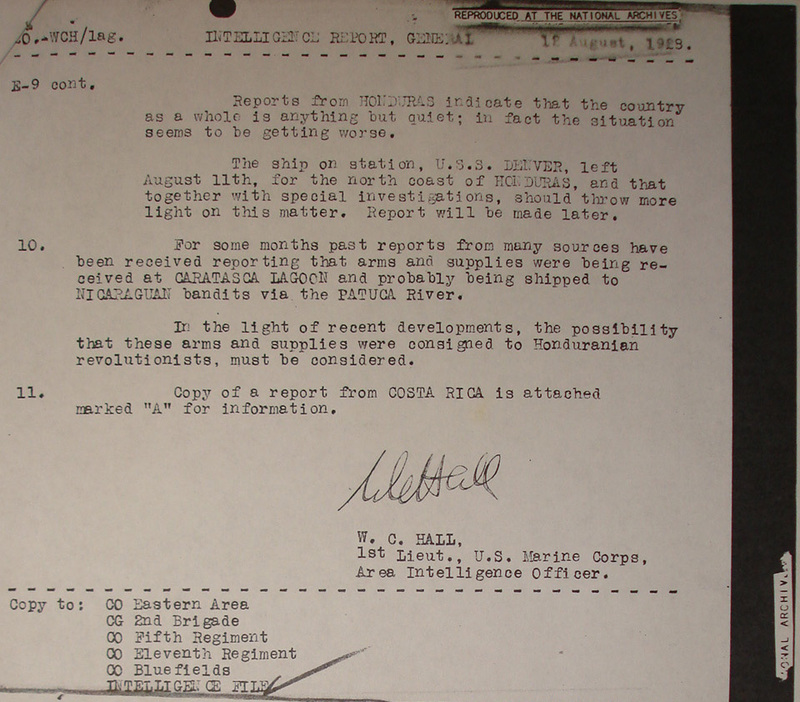 General Intelligence Report, 1st Lt. W. C. Hall, Puerto Cabezas (last pg. only). "Reports from HONDURAS indicate that the country as a whole is anything but quiet; in fact the situation seems to be getting worse. ¶ The ship on station, U.S.S. DENVER, left August 11th, for the north coast of HONDURAS, and that together with special investigations, should throw more light on this matter. Report will be made later. ¶ 10. For some months past reports from many sources have been received reporting that arms and supplies were being received at CARATASCA LAGOON and probably being shipped to NICARAGUA bandits via the PATUCA River. ¶ In the light of recent developments, the possibility that these arms and supplies were consigned to Honduran revolutionists, must be considered. ¶ 11. Copy of a report from COSTA RICA is attached marked ‘A’ for information. ¶ W. C. HALL, ¶ 1st Lieut., U.S. Marine Corps, ¶ Area Intelligence Officer." 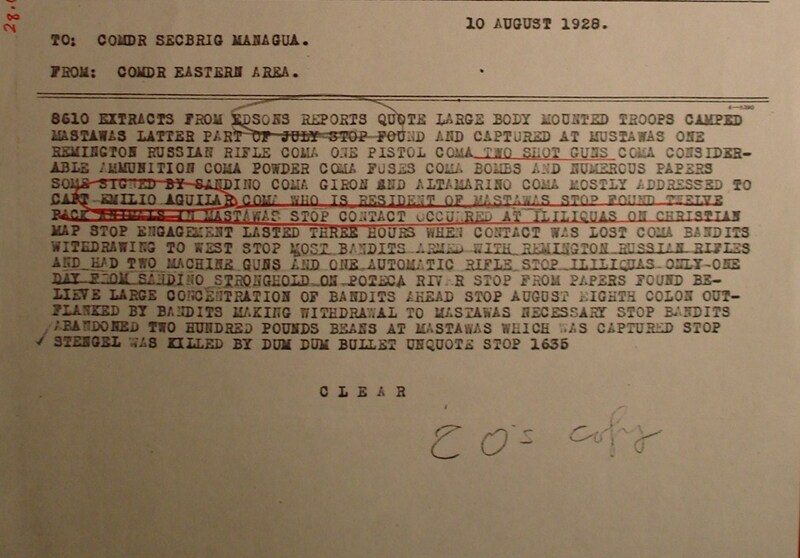 Air Patrol Memorandum #55, extracts, Managua to Santa Cruz to Somotin (no author indicated). "AIR PATROL MEMORANDUM #55. ¶ 1. Extracts from Report of Air Mission, dated 12 August 1928, are quoted for the information of all concerned: ¶ 2. 0905 – MANAGUA: Took off. ¶ 1015 – SANTA CRUZ: Normal. ¶ 1108 – FIVE MILES UP STREAM FROM SOMOTIN: Capt. Edson’s patrol. Dropped mail and shoes and made the following pick up: ‘TO CO EASTERN AREA 8612 TWO MEN, EVIDENTLY BANDITS COMING DOWN RIVER YESTERDAY TURNED NORTH INTO GOOD TRAIL LEADING NORTH FROM SHILOMATE, ONE DROPPED THIRTY EIGHT CALIBER RIFLE BULLET, SOFT NOSED, DUM DUM. SHILOMATE PLACE HOWARD CRASHED. TELL SGT MURPHY TO BURN PLANE. HOWARD LEFT FOR BOCAY 1300 YESTERDAY. PROCEEDING BOCAY. EDSON 0830.’ ‘TO R-2 EASTERN AREA 8612 ABRAM RIVERA FIVE FEET SIX INCHES – 175 LBS, SHORT, SQUAT SPANIARD – NATIVE JINOTEGA, RIVER MERCHANT AND BROTHER OF GUADALUPE RIVERA, OF SANTA CRUZ – ACTIVE AGENT MESSENGER AND RECRUITER OF SANDINO. NOT BELIEVED TO BE WITH SANDINO ON UPPER COCO RIVER. VERY GOOD FRIEND OF THOMPSON AND WEBSTER BOCAY. IS ALWAYS THOROUGHLY INFORMED SANDINO’S MOVEMENTS. HAS NO MILITARY TITLE OR POSITION. GUADALUPE BELIEVED COLONEL AT BATTLE OF QUILALAI. PRESENT WHEREABOUTS UNKNOWN. INDICATIONS LEAD ME TO BELIEVE FORCES OF SANDINO – JIRON and ALTAMIRANO ARE CONCENTRATED IN POTECA RIVER – ESPANOL GRANDE – POTECA AREA. EDSON 0840.’ A patrol was proceeding up the NORTH bank of river. ¶ 1130 – FOUR MILES UP STREAM FROM CAPT EDSON’S PATROL: Six men were seen to hide in a shed. Area was bombed. A direct hit was made on the shed. ¶ 1235 – GULKE’S LUMBER CAMP: Deserted. ¶ 1400 – MANAGUA: Landed at Airdrome. ¶ 3. The COCO RIVER was reconnoitered from SANTA CRUZ to SOMOTIN. Several suspicious places were bombed and ground straffed. Amount of damage is unknown. It is probable that outlaws suffered at least six casualties. Only one canoe was seen between POTECA and Capt. Edson’s patrol. This was hidden in a small creek about two miles from the COCO, indicating that outlaws are taking unusual precaution to prevent being seen. Twelve canoes were seen drawn up to the river bank at various places between SANTA CRUZ and GUIGUILI. Nearly all houses between SANTA CRUZ and POTECA appeared to be occupied. A total amount of 1,000 rounds of machine gun ammunition and 19 bombs were expended." "El Presidente del Consejo Departmental de Elecciones Mayor Price Inspeccionando," La Información, Bluefields, Aug. 16. Goodbye to Captain Kendall. Estimate of the Situation, Capt. H. D. Linscott, Cuvali, to Major H. H. Utley, Puerto Cabezas, p. 1. Estimate of the Situation, Capt. H. D. Linscott, Cuvali, to Major H. H. Utley, Puerto Cabezas, p. 2. Letter from Major H. H. Utley, Puerto Cabezas, to "My Dear Edson," p. 1. Letter from Major H. H. Utley, Puerto Cabezas, to "My Dear Edson," p. 2. Radiogram from Major H. H. Utley, Puerto Cabezas, to Capt. Cook CO Bocay, Capt. Edson CO Coco Patrol, and Gen. Feland, Managua. 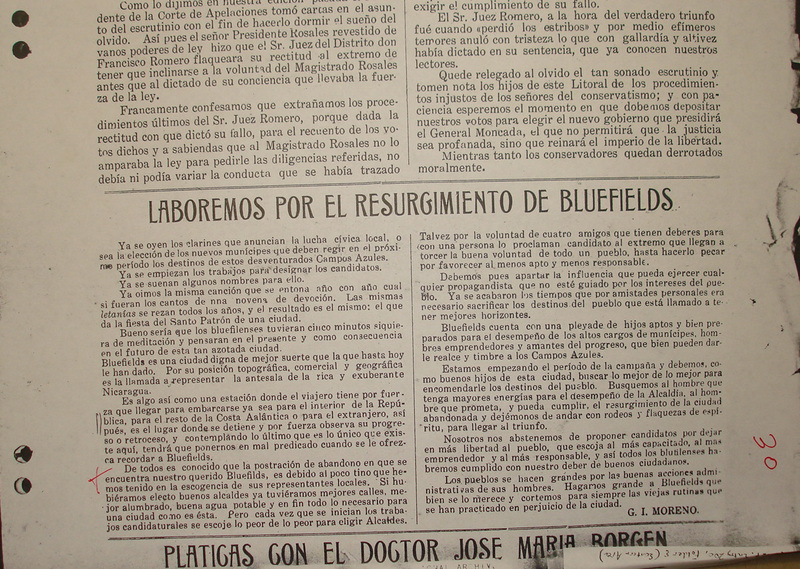 G. I. Moreno, "Laboremos por el Resurgimiento de Bluefields," La Información, Bluefields. 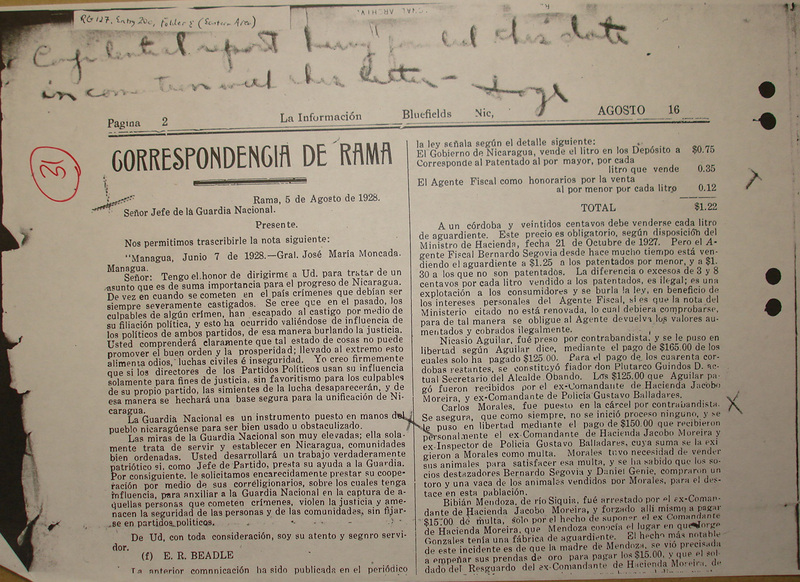 "Correspondencia de Rama," La Información, Bluefields, p. 1. "Correspondencia de Rama," La Información, Bluefields, p. 2. Letter on Estimate of the Situation, from Major H. H. Utley, Puerto Cabezas, to Gen. Feland, Managua, p. 1. "My dear General:- ¶ While awaiting the arrival of the transport plane I will take a few minutes to submit a brief outline of my estimate of the situation. ¶ From information available here it appears that the bandits are all in the general area about POTECA and there appear to be three plans open to them. ¶ 1st To withdraw into HONDURAS. ¶ 2ND To withdraw up the POTECA. ¶ 3rd To withdraw up the COCO and then up one of the tributaries thereof to the east or southeast towards GARRABO. ¶ Plan 1. If they withdraw into HONDURAS they may find a temporary refuge and possibly allies and supplies in limited quantities. They may be able to make a raid later into NICARAGUA shortly before the election and possibly have sufficient success to give color to a protest against the legality of the election. It appears doubtful if they will find even a temporary refuge at present although there is a probability that one of the parties in HONDURAS would ally themselves to Sandino if the revolution takes place there. They would give us an opportunity to concentrate our available force on or near the COCO AND WANKS Rivers and prevent their return. Such a move on their part would lower their prestige and morale, which must be already shaken by recent events. ¶ Plan 2. A withdrawal up the POTECA leaves the future adoption of Plan 1 open and also leaves an avenue of escape open to the leaders if all goes against them. They have recently been based out of this area and it is believed that their supplies there have been destroyed. They are getting nearer to the 11th Regiment posts and within reach of patrols from that organization. ¶ Plan 3. They keep the initiative in that we must follow wherever they go. They got away from the 11th Regiment. They move into the area familiar to them through which it is believed they have cut some trails; and where they may have packed some supplies. They may expect a breathing spell while we organize our position on the line of the COCO and prepare to move after them. ¶ Plan 3 would be most disadvantageous to us. I believe that they will adopt plan 3, but there is a possibility that the lure of a way out will cause the leaders to keep as close as possible to the HONDURAN border until forced with withdraw across it . . . "
Letter on Estimate of the Situation, from Major H. H. Utley, Puerto Cabezas, to Gen. Feland, Managua, p. 2. " . . . Plan 1. To carry out the original plan and occupy the COCO to and including St. CRUZ, retraining CUVALI. ¶ Plan 2. To hold CUVALI, the line of the COCO to POTECA (incl) and allow the Coco Patrol (Edson) to operate at discretion on the trail of the bandits. ¶ Plan 3. To hold the line of the COCO to POTECA (incl), and operate against the bandits from the direction of BOCAY, from their rear (direction of the COCO) and hold a position at or near CUVALI. ¶ Plan 1. This carries out my original orders but these orders have been modified although the modification may be revoked later. It contains the bandits in an unimportant area, and one not much involved in the election. There is no assurance that by passive action I can effectually contain the bandits in this area. It leaves the initiative to the hands of the bandits. It leaves the final objective, the elimination of these bands to be done at a later time. It jeopardizes the accomplishment of our principal mission since it enables them to make a sudden dash about the time of the election and interfere with the election. It leaves them unmolested in an area too close to American properties to the south and east. Rejected. ¶ Plan 2. Edson is my most active leader. His men are experienced and can follow wherever the bandits go. The supply will have to be by air. This plan can be undertaken with less delay than either of the others. Even with the line CUVALI – LA LUZ – PIS PIS – WASPUC – COCO River from WASPUC to POTECA (both incl) held there is left a large area in which the bandits can operate and they may avoid contact altogether, or outflank Edson and move to the west. The movement is in the nature of a penetration. ¶ Plan 3. Operations from three directions, for the outpost at CUVALI is to a certain extent mobile, will, if successful, force the bandits to make a last stand in the mountains, disband, or drive them on to our posts at the mining areas, where out supply problems become simpler as theirs become more difficult. A successful attack by air after the three patrols get within striking distance should result in the annihilation or disbanding of the bands. Any band that succeeded in getting away could be followed and prevented from doing much harm. Success would mean the end of organized resistance. Supply problems are more difficult. Coordination is difficult but not impossible especially as the new radio sets were received yesterday. There will be some delay in inaugurating the movement. ¶ Subject to orders from higher authority I decide to adopt plan 3. ¶ The 60th Company will hold the La LUZ and PIS PIS sectors and occupy CUVALI prepared to move to the north towards GARRABO. ¶ The 59th Co. will hold the line of the WANKS from WASPUC to MASTAWAS both incl. and operate from BOCAY up the BOCAY River in the direction of GARRABO. ¶ The Coco Patrol (Denver and Galveston Detachments) will hold the COCO from at POTECA and operate against the bandits from the direction of the COCO eastward towards GARRABO. ¶ The Tulsa Detachment will occupy a critical position between MASTAWAS and POTECA or at the discretion of the CO at BOCAY. (This detach is now moving [section missing] . . . "
Letter on Estimate of the Situation, from Major H. H. Utley, Puerto Cabezas, to Gen. Feland, Managua, p. 3. " . . . SUPPLY: 60th Co. via LA LUZ supplemented by air. ¶ 59th Co. via WASPUC and BOCAY. ¶ Coco Patrol by water from WASPUC to POTECA, thereafter off the country supplemented by air. ¶ COMMUNICATION: Radio sets are established at WASPUC and BOCAY. One is en route to BOCAY to be sent forward to the Coco Patrol. Two are en route to LA LUZ one for that post and one for CUVALI Patrol. ¶ If the bandits adopt Plan 1, I will have to establish a line of posts along the WANKS with a mobile force centrally located ready to move against them if they succeed in breaking through in any numbers. It would be necessary to retain a guard in the mining areas, but the bulk of the 60th Co. would be available for duty on the WANKS. ¶ If the bandits adopt Plan 2, the COCO Patrol will continue to advance directly against them. ¶ It appears that we are approaching one of the delays due to lack of transportation which while I anticipated, are nevertheless heartbreaking. Since my recent visit to WASPUC and BOCAY the supply situation has considerably improved. We are, however, still handicapped by two factors: the lack of boats and the disinclination of the indians to go into the zone of operations. We can get enough to operate all the boats we have so far up to BOCAY but it is difficult to get them to go further than that. Impressment only seems to kill the goose that laid the golden egg, as it means that in the future the approach of Marines is the signal for the abandoning of the towns and houses. We have been at some pains to establish a feeling of confidence among the indians and hope that the situation will improve. The fact that Edson did not have any of his Indians hurt was an important factor and I took pains to broadcast that information down the river as well as at BOCAY. We have secured some additional boats since my return here. We have lost quite a number of boats in our operations, more than we expected. ¶ The loss of our other plane is a severe handicap at present. I hope the additional planes will not be delayed. ¶ With kindest personal regards, ¶ Very respectfully, ¶ Harold K. Utley." 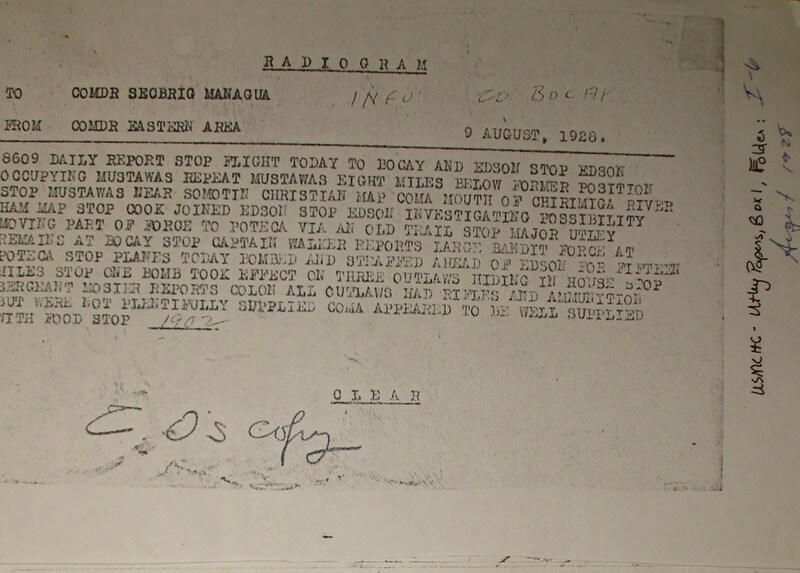 Radiogram from Gen. Feland, Managua, to Major H. H. Utley, Puerto Cabezas (p. 1 only). Report against Nicasio Vargas, former commandante of civil police, El Bluff, by Capt. A. B. Sage, Bluefields. "1. I have to report that I have definite information that during the incumbency of Nicasio Vargas as commandante at El Bluff, Nic., that he accepted a retained fee of $50.00 monthly from the Cuyamel Fruit Company. ¶ 2. The amount in question is one of a similar series of payments made to various civil police officials throughout the Area for protection of the activities of the organization. ¶ 3. It is believed that the purpose of the fund is as follows, when a barge or steamer of the fruit company is loading at one of the places where there is a police official he is expected to prevent any interference with the handling of the shipment and to give the Cuyamel Fruit Company vessels the right of way. This plan works in two ways, if the civil police official should take it upon himself to arrest the Captain or Engineer of the steamer or barge for some real or fancied violation of laws this would mean that the vessel would be unable to maintain the schedule. It is believed that to prevent this last occurrence that the fruit company considers it best to pay in advance and eliminate such a happening. ¶ 4. A secret fund is maintained by the Fruit Company for payments of this nature and it is and would be impossible to prove such payments but never the less they are being made to the best of my belief. ¶ 5. Since the relief of Nicasio Vargas as Commandante at El Bluff he has been idle but it appears that he is well connected with the officials at Managua and an effort will probably be made to appoint him to some government sinecure shortly. This man is a cousin of Colonel Vargas, who is or was an aide to the President of Nicaragua. ¶ 6. Until such time as the Guardia Nacional has taken over all civil police activities in this Area it is believed that it will be difficult to obtain proof that will form a basis of charges against persons such as Nicasio Vargas as the business concerns will not acknowledge or admit that such payments are being made. This is a natural feeling and difficult to overcome. ¶ A. B. Sage." Radiogram from Gen. Feland, Managua, to Major H. H. Utley, Puerto Cabezas (repeat of above - more legible version of top section). 17 August 1928 (no time indicated).